Growing up in the South you become familiar with BBQ before you can even say the word BBQ. For me it was the whole hog variety, smoked all day over the fire. In North Carolina, BBQ means whole hog, not sauce or beef ribs or even chicken. So it's taken me a while to acclimate to the term in reference to anything outside of the pork shoulder filled spectrum. Like Chicken under a brick..Have you tried that? Why not? A brick wrapped in foil laid on top of a butterflied whole chicken, gives you crispy skin and juicy chicken even Colonel Sanders would be smile at. Yes I know he's always smiling but this time it would be cause of your chicken. Enough about that. Blue skies, warmer weather and fresh summer produce are just a few things I love about this time of year. Also, not having to get your kid dressed and off to school by some ungodly hour in the morning. My son looks great in his pajamas all day. Don't judge me. Spending time outside with family and friends and of course firing up the grill also makes summer more enjoyable. Even when sweating uncontrollably in that new anthropologie dress you bought especially for your summer soiree. But you look good so whatever. Here in the south we love our bbq, especially when coated with the right amount of sauce. There are so many different ways to get creative with barbeque sauce, one of my favorites being adding in fruit to give your grilled meats a bit of tangy sweetness in each bite. 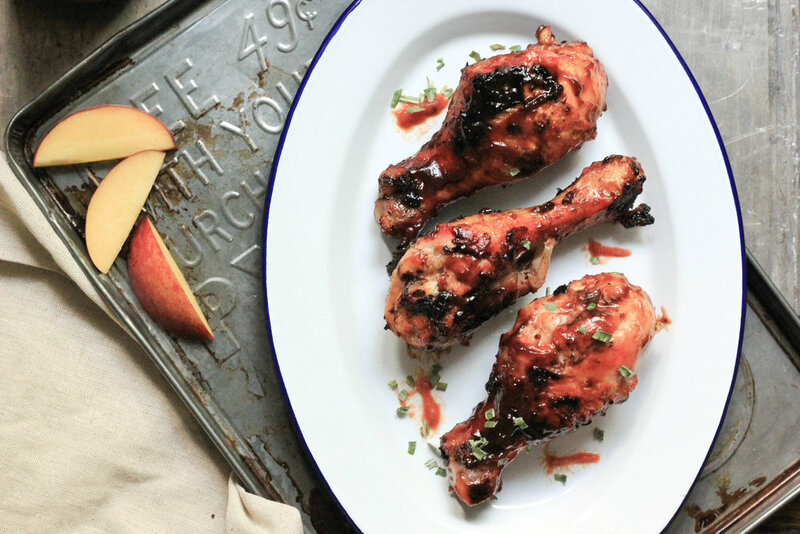 This robust peach bbq sauce lends a mellow sweetness to grilled chicken and pork. This year grilling will go a whole lot smoother as I've teamed up with the folks at Reynolds Wrap to show how much easier grill life can be with their non stick foil. Just try not to get any sauce on that dress. Directions: Preheat grill for medium heat. Add first 5 ingredients to a saucepan and bring to a boil over medium high heat, seasoning with salt and pepper to taste. Reduce to simmer until the peaches are tender. Remove from the heat and allow to cool. Add mixture to a blender, pulse together with the olive oil to combine. Add sauce to a small bowl and set aside. Season chicken with salt and pepper, then brush with prepared sauce. Reynolds Wrap Non Stick aluminum foil works great when grilling, for this recipe I used a foil sheet long enough to cover the grill grates one side of the grill, then poked a few holes in the foil. Lay the prepared foil on the grill and place the chicken on top. Grill chicken, skin side up, rotating occasionally and moving to the cooler side of the grill as needed to control flare ups. Continue grilling, turning and basting with the peach barbecue sauce often, until chicken is cooked through and an instant read thermometer inserted into the thickest part registers 165, about 10-15 minutes. Remove from the grill and enjoy with all your summer side fixins.